Monkey Mincing Onion - note the knife she is using?! 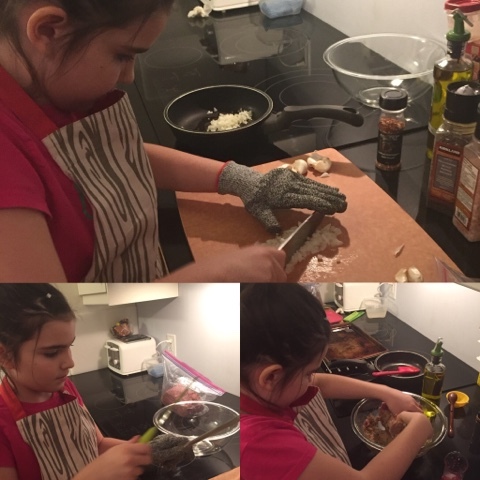 One of the things that she loves doing - and I would like to think in part because she knows I love it - is cooking and baking. 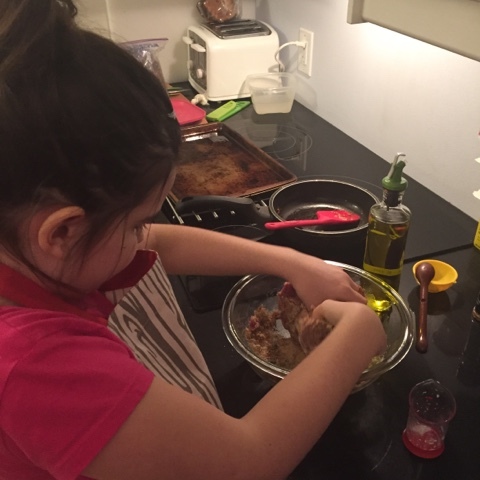 Now I know when I was a kid I used to bake things with my mom sometimes or even in high school I took Home Economics and was taught - but she's 9 and she has been at this for years now. 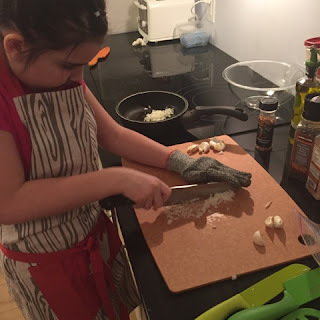 She not only wants to measure the simple thing she wants to be involved in every aspect of cooking - including knife work. Granted she's 9 - almost 10 years old and sometimes lacks patience needed for consistency she has no fear of diving in. She also prides herself on making her own lunches now (including cutting the fruits and veggies). She also has taken to one night a week where she gets to decide the menu and make it all (usually all from scratch if we can). Do you see why I love this kid? So when I set out to make the Meatballs of course a monkey was on board for helping out. The first issue were her knives - so I taught her how to hone her knives properly and then clean them. If you don't know how to do this LEARN - the first time I did it I could NOT believe the difference that properly honed/sharpened knife made in the kitchen. Since that time (years ago) I make sure I do it often and will often secretly do it to other peoples knives if they aren't looking. It just makes life so much easier. From there the recipe was relatively easy and straight forward to follow. I didn't make any modifications to the recipe - however for next time I would. I would probably use half of the chile flakes in the meatballs themselves as I found them spicy and then up the amount in the broth. I also found that there was way more broth than meat so I would probably also increase the amount of meatballs that I used. 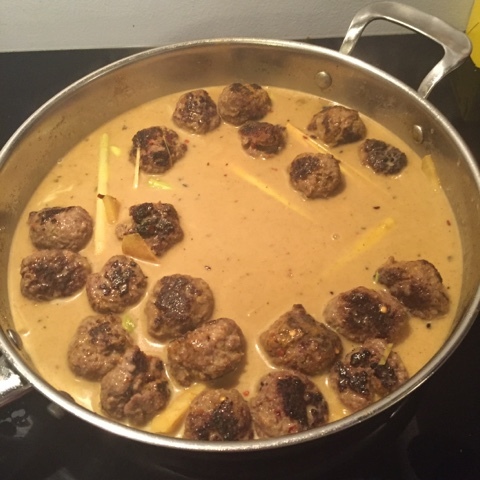 Last tip I have is for the meatballs - now I have made many different kinds of balls in my life but have always had a problem with consistency. I was lucky enough to get a cookie scoop for my birthday - best invention ever for making meatballs - I got them a consistent size and it worked really well and was easy to clean. A little note about lemon grass because some people haven't used it before - I cut off the bottom root part (think of green onions) and the peal off the outer layer of leaves. Then I cut it down the centre length wise. Then take the back side of a knife and beat the lemon grass up - you can also pick it up, flex it and move it to help release the oils. Then I cut into 2-3 inch pieces and put in the broth. When I have done an infusion like this before I actually put the lemon grass, ginger and garlic in a cheese cloth so I could take it out. Note - don't eat lemon grass - I mean you can but I would recommend against it. First prepare the meat balls. Sauce the onion and garlic with salt and pepper to taste in a hot oiled frying pan for about 5 minutes until soft and lightly coloured, adding the chile flakes after a minute or two. Place the beef in a large bowl and season with salt and pepper. Put the breadcrumbs in a separate bowl and moisten with the milk. Season with salt and pepper, then stir in the breadcrumbs and onion mixture into the beef and combine well. With wet hands, shape the beef mixture into class about the size of a golf ball. Transfer to a lightly greased plate or baking sheet and chill for 30 minutes until firm. Brown the meatballs in a cleaned oiled pan for 4-5 minutes turning frequently until nicely coloured on all sides. Add the coriander sees, cardamom, turmeric, cinnamon, chile flakes, lemongrass, and ginger. Heat through, stirring until aromatic, then add the stock and coconut milk and bring to a simmer. Taste and adjust the seasoning as necessary. Simmer for 8-12 minutes until the sauce is flavourful and thickened and the meatballs are cooked through. Add the lime zest and juice and serve hot.